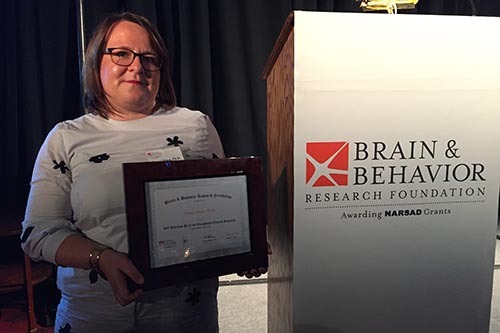 Dr Danai Dima, Lecturer in Cognitive Neuroscience in the Department of Psychology at City, University of London has received an honourable mention for the 2017 Gerald R. Klerman Award by the Brain & Behaviour Research Foundation (former NARSAD). The Annual Klerman Prize recognises exceptional clinical research, and Dr Dima specifically received the award for her work in identifying resilience in Bipolar Disorder using a genomics imaging approach. The award ceremony took place on Friday 28 July at the Metropolitan club in New York. Dr Dima’s lab uses a multifactorial approach to understand risk and resilience to psychosis across the lifespan, utilising clinical, cognitive, neuroimaging, genetics and epigenetics data. For her project entitled “An Integrative Genomics and Imaging Approach to Identify Resilient Mechanisms for Bipolar Disorder”, she studied factors associated with resilience to bipolar disorder which are commonly overlooked in research. In particular, Dr Dima examined the interplay between brain function and genes in people with bipolar disorder; their resilient relatives who share genetic features predicting bipolar disorder but show no symptoms; and unrelated people without any psychiatric disorder. One major finding of the project was that functional connections between different brain regions (“communication patterns within the brain”) showed that participants with bipolar disorder and their relatives have increased connections between the amygdala, crucial for emotional responses, and the ventromedial prefrontal cortex, part of the brain’s executive centre that helps inhibit emotions and make decisions. However, resilient relatives additionally showed increased connections between brain regions involved in visual processing, particularly face recognition. This additional hyper-connectivity observed only in resilient relatives can be viewed as an adaptive network response; this response can be inferred as adaptive because it is associated with preserved mental well-being in the relatives. In regards to genes, measuring an individual’s accumulation of genetic risks of developing bipolar disorder (polygenic risk score) may be helpful in identifying brain circuit abnormalities that give rise to aspects of mood dysregulation which is characteristic of the disorder. Through this research, it is Dr Dima’s goal to offer new insights for the prevention and treatment of bipolar disorder. Her findings can assist in formulating biologically informed early intervention strategies to avert psychopathology and contribute to the development of future studies on high-risk populations by identifying high-risk individuals before the manifestation of the disorder. Dr Dima received a BSc in Psychology from Panteion University, Athens, Greece and an MSc in Integrative Neuroscience from Imperial College London. She was awarded a Marie Curie Early Stage Training Fellowship for her Ph.D. studies in Cognitive Neuroscience, completed at the Hannover Medical School, Germany.